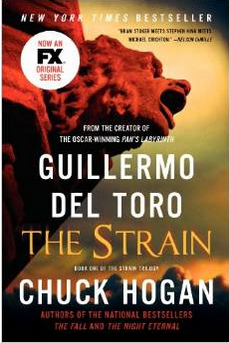 Guillermo Del Toro and Chuck Hogan’s The Strain is a complex and interweaving multi-narrative story centered in 21st century New York City during the inception of what promises to be a worldwide pandemic. This pandemic is supernatural in variety. Usually with books like this, the perpetrator is turning people into some kind of monster, such as a vampire or a zombie, but in this book the perpetrator is turning people into both. Traditionally, these two kinds of monsters are rooted in political fears. Often, when a democratic president is in office, zombie movies become very popular because they represent what the left wing fears most: conformity and mindlessness. At the time that this book was written, the United States had not only elected a democratic president but also our first African American president, a massive milestone in the nation’s history. What’s interesting about this book is that it also utilizes the fears of the opposing political party via the use of vampires, which represents what republicans fear most: foreign entities with no moral code. Del Toro and Hogan’s choice to include this duality of fear in this book is interesting because it provides something for everyone to fear both on a conscious and subconscious level. The book follows multiple narratives, but the main narrative is that of a doctor named Ephraim Goodweather who, at the start of the novel, is losing a custody battle for his son. He is called in to investigate an airplane at the JFK airport which had an uneventful landing but mysteriously shut down on the taxiway and could not be contacted from outside. He and his partner are granted entrance and what they find inside are many dead bodies and four living. The four alive are initially free of symptoms but taken to a hospital anyway. One of the four is a lawyer and she convinces the rest that there is no reason for any of them to be in the hospital so all of them leave except for one, the co-pilot of the plane. The novel then follows their narratives as they each develop more symptoms, particularly debilitating headaches and sore throats that simply cannot be soothed. We begin to learn that these people have vampiric tendencies when one of the survivors, a rockstar, is involved in a sexual tryst in which he takes a hickey too far. The next survivor drinks the blood from his two saint bernards. The story takes off very rapidly, jumping from narrative to narrative, introducing new characters regularly and returning to old ones often. It is very slowly revealed through a key player named Abraham Setrakian that this is all the work of a man named Sardu and these creatures are of a very old kind called strigoi. He knows how to defeat them but the mainstream thought is, of course, highly preventative, so Ephraim and his partner must first be convinced and then help Abraham along the way. This book was very tied to politics which I found interesting. On the surface it is simply about a doctor who gets involved in something that he doesn’t understand but truly it is about how political our world is. At the beginning of the book, Ephraim is a very respected and high ranking doctor in the CDC but as soon as he begins to submit ideas that the CDC disagrees with his authority is called into question and when he presses these ideas the CDC goes as far as making him a fugitive of the law. The book doesn’t directly state this, but it would seem that one of the main themes in the book is that our culture is so afraid of being wrong that we focus all of our authoritative power on blocking any unfamiliar ideas and forget to actually explore them, regardless of how scary they may be. After Ephraim is stripped of his title at the CDC and made a fugitive, his tertiary plot line becomes fighting the politics of medicine, which holds a heavy irony because many people don’t assume that a doctor would have to fight to save his patients. This book works so well because there is simply so much going on. Ephraim himself is racing to stop hordes of zombie vampires while also trying to maintain his relationship with his son and evade the law. All of this is coupled with the individual plot lines of numerous other characters to create a book that simply doesn’t have time to be boring. In my opinion, the kind of audience who would enjoy this book must enjoy horror novels and, to some degree, mystery novels as well. There is a lot of mystery and a lot of questioning in this novel and most of the questions don’t get answered until the very end. Anyone who reads this book must be able to deal with a sense of dissatisfaction as well because this novel is not lacking for moments of perfectly executed frustration and weariness. Finally, this book is intended for gore fans as there are many graphic descriptions of many gruesome deaths within its pages. 585 pages. Published by HarperCollins. USA $9.99. Going into the theatrical performance of Cripple of Inishmaan, I found myself wondering how they planned to stage a number of things. I’m not very good at coming up with staging ideas so I found myself at a loss for ideas on how to block more complex scenes, such as Billy’s monologue in the hotel room and when Babbybobby attacked Billy with the lead pipe, but one thing that I was really excited to see become realized was the actual manifestation of Billy’s ailments. The play doesn’t give much detail about Billy’s physical deformities. It only mentions that he shuffles from place to place, leaving the play wide open for interpretation. I had no idea what to picture Billy like physically because there simply weren’t enough physical characteristics given to me so I was excited by the opportunity to see the play and experience someone else’s idea of what Billy moved like and how his body appeared. In the theatrical version of the play, the first time we saw Billy, it was a bit of a shock. There was a rather startling thudding noise from offstage which the audience quickly learned was Cripple Billy. He limped heavily with one leg straight and one leg bent awkwardly, foot off to the side. The movement was labored and difficult to watch. One arm swung back and forth, as if to propel Billy forward, and one was tucked into a contorted sort of knot in his chest. The physical display was very present and imposing onstage, and it demanded attention. The actor playing Billy never faltered in his portrayal, staying committed to the appearance of physical deformity the entire time. After the play I had a chance to talk to Jayne Decker and ask her how she worked with the actor who played Billy, Aaron Verrill, to create the look of disfigurement. She said they started simply by reviewing photos of different disfigurements, drawing much of their inspiration from cerebral palsy. The twisted and bent in arm was their starting point. Jayne asked if Aaron could maintain the arm and hand placement throughout the play and once he decided he could it became the centerpiece for the rest of the body. Next, Aaron was given leg weights so he could practice walking with a heavy limp and drag. The leg weights were kept through practice to help Aaron learn to walk as though his legs were stunted or damaged in some way, though they were eventually removed and not present during the actual performances. The practice with the leg weights enabled Aaron to act as though he was moving with damaged legs. After having seen the play and having seen someone else’s manifestation of Cripple Billy, I think I would have done something very similar. I just might have tried to add some kind of tick or twitch if possible to add to audience and character discomfort. There is little you can do to hinder an actor’s ability to move while also keeping them functional, especially since in this case Billy has to be able to shuffle and carry books among other things. Along with that, actor comfort is also a concern. If the person playing the character can’t maintain his posture it simply won’t work. I think Jayne had a great interpretation of Cripple Billy in her performance of Cripple of Inishmaan. Psychoanalyzing The Office’s (US) own Michael Scott within the context of the entire show could take years of professional work. Michael is such a psychologically damaged character that his time on the television program The Office could prove to be an interesting case study for anyone brave enough to plunge into the depths of his psyche. While I am not currently the one to explore the farthest reaches of Michael Scott’s mind, I would like to pick apart a moment in Michael Scott’s history. The scene I intend to discuss comes from season 3 episode 10, A Benihana Christmas. For context, Michael has a girlfriend named Carol who has two children from a failed marriage and he is very excited to invite her to an all inclusive trip to a resort in Jamaica over Christmas. Carol has appeared a few times in the show and has never seemed particularly happy to be with Michael. In the scene, Carol comes into the office clearly upset and demands that Michael see her in his office. She pulls out a Christmas card and demands that Michael explain it. It is a picture of Michael, Carol, and her two children on a ski trip, but we learn that Michael had actually photoshopped his own face onto that of Carol’s ex husband. Carol attempts to explain why such a thing is not okay but Michael can’t seem to understand the problem so Carol promptly breaks up with him. As a response, Michael takes the opportunity to invite Carol to the resort in Jamaica. Carol, of course, responds by leaving and Michael spirals into a deep depression. The children in the card are roughly between the ages of nine and twelve. Divorce is an extremely stressful event for everyone inside the circle of a family, especially children. Children must cope with the fact that their parents no longer love each other, understand that they will have to divide all of their time and energy between two households, and that they will have to see their parents in separate settings for the rest of their lives. It can make kids angry and scared and upset, having lasting consequences for years. Children are predisposed to dislike step parents, especially ones who were brought into their lives soon after their original parents divorced. These new entities are like parodies of their original parents. To a child stepfather is like an imposter father, a man brought in to replace the original father. The stepfather typically parents differently and acts differently toward the child, making the child harbor resentment already. If this parody father were to do anything to prove to the child that he were in any way bad, the child would only allow it to build up his or her own dislike. It is the responsibility of the parents to take care of their children and to advocate for them. During and after a divorce, it is important that a parent make sure that his or her child is okay mentally and emotionally, especially if the parent is choosing to date again, as bringing in a step parent can become a new stress for the child. In Carol’s family circle, Michael would be acting as potential stepfather. The fact that Michael sees no initial problem with putting his own face over the children’s biological father in the first place is key to his personality. To Michael, nothing he does is wrong. Carol has only been divorced for one year by this point in the show and her children have not even moved out of adolescence and yet he has decided it is okay for him to take their father out of picture and memory and put himself in their father’s place. When Carol attempts to point out how weird it is that he might do such a thing, he explains it away by saying that he was “in her heart and next to her kids.” Michael is so invested in the idea of being the father of her children that he sees nothing wrong with cutting their actual father out completely. By the time Carol has realized that she needs to break up with Michael, he extends the invitation to the resort to her, which reveals to us another point of Michael’s psychology. He doesn’t realize that Carol can’t go to a Jamaican resort over Christmas because she has two children. She is simply advocating for her own children’s needs, ridding herself of a man who cannot respect her family’s boundaries as he continues to disrespect them. This scene reveals to us that Michael is a rather self involved individual who feels that all of his ideas are brilliant. He lives without responsibility and without consequence so he automatically assumes that everyone around him lives without responsibility and consequence, even when it should be clear to him that this is not true. Michael is not bound by children so he does not see Carol’s children as binding or even important. He sees no fault in assuming the role of their father, or in inviting their mother to a resort which is not child friendly over Christmas vacation. After Carol has had enough and chosen to break up with Michael, he has a breakdown in his place of work. He cries at reception, listens to sad songs at full volume, and even uses a company credit card to go to lunch so he can cheer himself up, all while trying to convince various women to go to the resort with him because to Michael Scott all that really matters is that he can make sure his plans don’t fall through.